As parts of the Ogallala aquifer are depleted faster than they are being recharged, figuring out how to become more and more efficient with increasingly less available water is a critical challenge for the region’s producers. 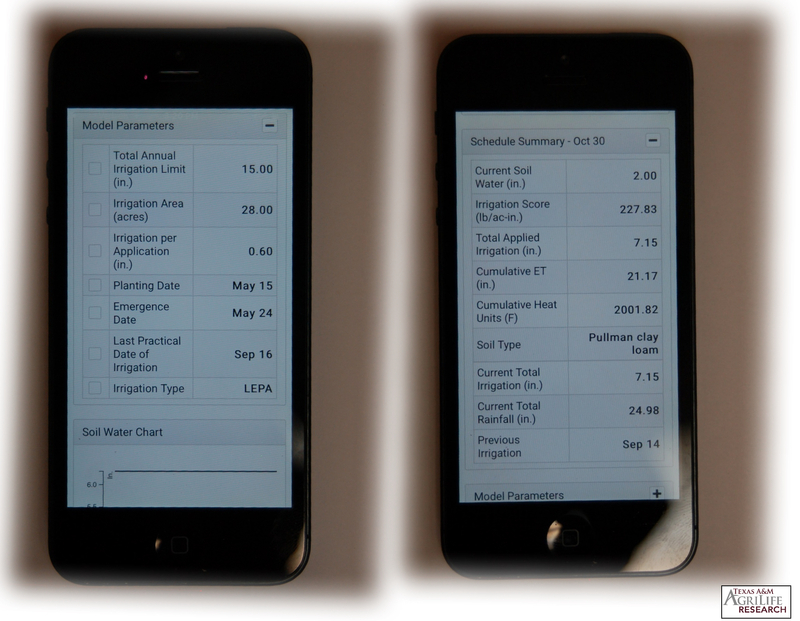 Irrigation scheduling tools can help farmers evaluate how much and when to irrigate their crops. 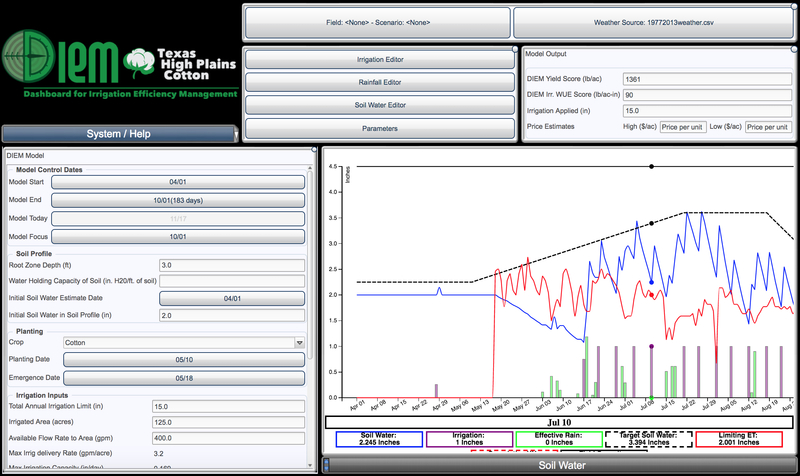 One new tool, the Dashboard for Irrigation Efficiency Management (DIEM), is a product of Texas A&M AgriLife Research, the Texas A&M AgriLife Extension Service and the Texas A&M Engineering Experiment Station’s Texas Center for Applied Technology (TCAT). Ongoing work to further develop DIEM is supported in part by the Ogallala Water CAP. What’s under the hood of the DIEM dashboard? The tool integrates local farm and environmental information with results from prior water-​use efficiency field experiments. The DIEM dashboard prescribes a season-​long, field-​specific irrigation schedule that optimizes yield and water-​use efficiency based on rainfall and irrigation availability. Farmers can use this schedule to enhance or confirm their irrigation decision making. As the growing season progresses, they can update the irrigation schedule recommendation based on real-​time observations. One way that DIEM is unique is that it accounts for different soil surface evaporation losses specific to spray, low energy precision application (LEPA), and subsurface drip irrigation (SDI) systems. “In years of high rainfall, the difference in application efficiency between LEPA and SDI is small, and vice versa,” Bordovsky points out. “You can intuitively know this, but it’s much easier to quantify, understand, and make decisions by visualizing the many interactions through graphs.” The tool also is configured to account for shifts in crop water needs at different stages of growth. DIEM also provides access to data for local soil moisture storage capacity (plant available water capacity), which can be overridden by the user, if so desired. Automated weather station data for the Texas High Plains feeds into the tool from the Texas Tech Mesonet Network, on-​farm weather stations, a National Weather Service station or other network stations, where available. Users can currently access DIEM on their desktop computers; the online tool includes a user guide and a help option. A mobile version of DIEM is planned for release in time for the 2018 growing season. Screenshot, desktop version of the DIEM app. Ongoing work to improve DIEM. DIEM is currently in a beta-​testing phase. During the 2017 crop season, on-​farm tests of DIEM were used to evaluate its performance under different conditions (different soil types, production practices, etc.). These on-​farm tests included soil moisture monitoring and the use of on-​farm weather stations equipped with commercially available equipment and telemetry/​internet data service. The results from these tests will be used to further improve DIEM performance and user-​friendliness. To that end, Bordovsky and other team members currently have several research projects underway that will be used to further improve DIEM. For example, they are evaluating and developing DIEM crop functions for a wider range of crops, including sorghum and corn grown with limited irrigation and hail damaged cotton. Pre-​plant and early season SDI irrigation with past and ongoing pivot applications are also being compared. Periodic and real-​time soil water measurement methods will be applied to inform DIEM’s calculation of soil water to improve its yield score estimates. Software improvements also being implemented into DIEM include improving crop functions based on early and mid-​season water availability and the development of interface between DIEM and the DSSAT-​CROPGRO-​Cotton model in an effort to improve yield scores. The team is also working to improve DIEM’s interface and the user-​friendliness of the DIEM mobile app. In 2016⁄17, county agents and cotton producers were introduced to the research behind DIEM and provided demonstrations on how to use the tool at several workshops. Additional training sessions are planned. Feedback from these workshops thus far indicates that users like DIEM’s automated data inputs (reducing requirements for data entry by the user) and its ability to optimize limited irrigation water capacity. This text updates an article authored by Kathy Whythe for the Texas Water Resource Institute in their Spring, 2016 issue of txH2O. DIEM’s developers need beta-​testers. Are you interested? Visit the DIEM website to register for a free account. “We would really like people to try this tool and provide feedback,” says Jim Bordovsky. Ideal candidates to try DIEM are “producers with a technical background, who are patient, persistent and comfortable with computers” and who understand that this tool is still a work in progress. DIEM aims to help irrigators see the relationships between soil water, planting dates, weather and irrigation and their effects on crop yield and water-​use efficiency. The mobile version of the DIEM app will be available for the 2018 growing season. Research by Bordovsky and his colleagues has demonstrated that limiting early season cotton irrigation could potentially reduce annual water use by more than 27 trillion gallons of water per year on the High Plains, with relatively small declines in lint yield. Such water savings can be very meaningful for producers and non-​producers alike, given that one inch of water conserved on half of the region’s irrigated cotton acreage annually represents a volume of water greater than the city of Lubbock’s current municipal water demand for a 20-​month period (83,000 acre-​feet). “If we can create tools based on solid research that help producers reduce water use with minimal risk and that producers use, we’ll have more water for the future and keep farmers in business,” says Bordovsky. DIEM’s origin story. The idea for DIEM grew out of a four-​year field research project completed by a group that included OWCAP project team member and senior research scientist and agricultural engineer Jim Bordovsky (TA&M AgriLife Research). 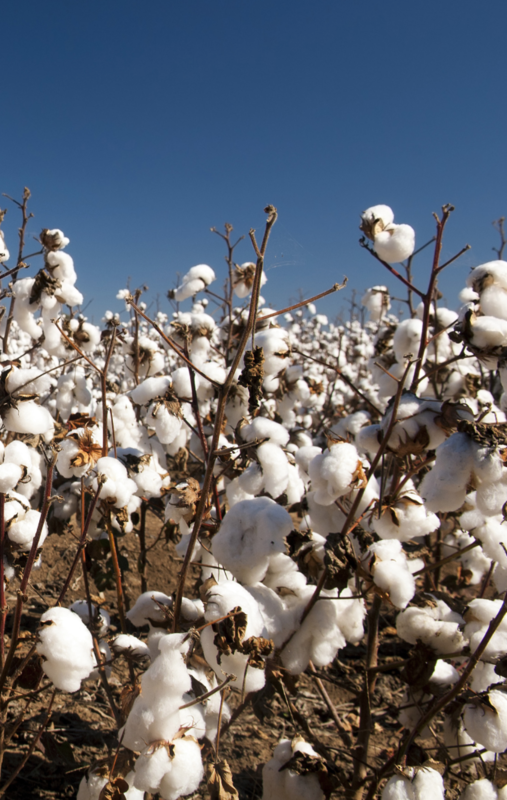 That project looked at defining water-​use efficiency within segments of the cotton-​growing season. The researchers wanted to determine the best time during the growing season to apply limited water to get an optimal return in terms of crop production per unit of water invested.